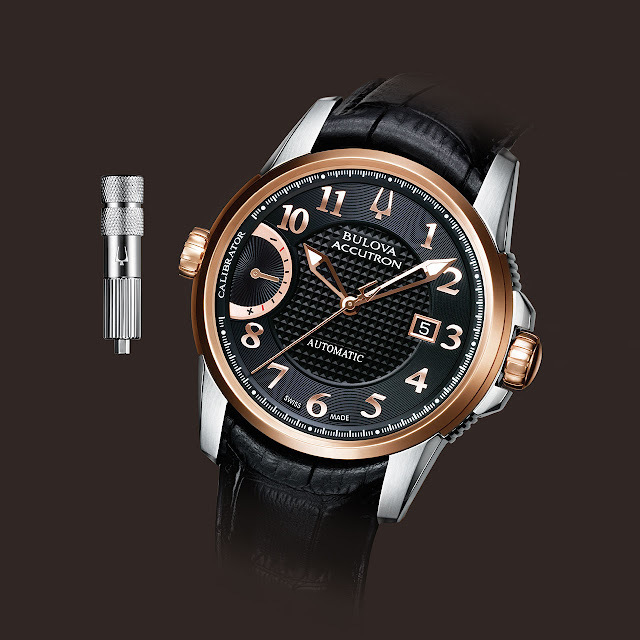 Bulova Accutron presents the first ever automatic watch that lets the wearer individually control its accuracy thanks to the External Fine Adjustment System (EFAS). No need for a professional; the wearer operates the system by inserting a key at the 9 o'clock position to achieve precision of 99.99% on average. The case in stainless steel with rose-gold PVD coating accents integrates an anti-reflective sapphire crystal, while a screw-down transparent back gives a clear view of the automatic mechanism with its 26 jewels. The EFAS indication with retrograde hand is positioned opposite the date window.. Water-resistant to 50 metres, the Calibrator is mounted on a black leather strap incorporating a folding clasp with double pushers.